Excellent all-round efforts from Ryan Baldry and Ellery Lilley steered Filey 2nds to a 147-run win at Scarborough 3rds in Division Four East. Baldry showed his experience at a higher level with a knock of 106, Lilley also impressing with 52 not out as Filey coasted to 232-5. Former Flixton ace Baldry then took 4-8 and Lilley 4-30 as the home side were all out for 85. Cayton 3rds lost by 20 runs at home to Wold Newton 2nds, despite dismissing the visitors for 93. Keith Meatheringham bagged 4-18 as Newton stumbled with the bat, and Steve McAleese gave Cayton hope with 26 but top bowling from Matthew Atkinson (3-18), Dave Stockdale (3-19) and G Taylor (3-21) saw Cayton slip to 73 all out. Muston eased to an eight-wicket win at Ravenscar 2nds.. 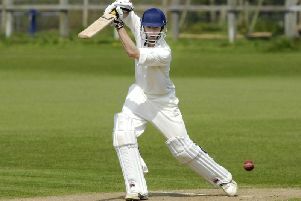 In Division Four West, Malton & Old Malton 4ths won by eight runs at Thornton Dale 2nds. John Sims' 47 not out helped Malton to 104-3, and in reply J Cooper's 43 gave Dale hope but three wickets apiece for Michael Liversidge and Tristan Harrison saw the home side bowled out for 96. Ganton 2nds eased to a six-wicket success at a weakened Forge Valley 3rds. John Flinton's 50 not out dominated Valley's 76 all out, P Elliot taking 3-3 and on-loan bowler Michael Kipliing 3-7. Freddie Lockwood's 30 took Ganton to victory. John Kinghorn's 105 not out failed to save Pickering 4ths from an eight-wicket loss at Wykeham 3rds. The Pikes posted 163-2, but Robin Shepherdson (78) and David Hayward (56no) steered Wykeham to the win. Pickering 3rds had better fortunes, winning by three wickets at home to Ebberston 2nds in Division Two. Jacob Waters hit 51 not out as Ebberston made 151-6, Tony Evans' spin bowling earning him 5-13. George Baldwin's undefeated 57 took the Pikes to victory, with Luke Shepherd adding 25. Sewerby 2nds won by three wickets at Wykeham 2nds thanks to a fine all-round show by Calvin Roche. Seam bowler Roche grabbed 4-26 and Louis Atkinson 3-27 as Wykeham reached 154-8, Tom Poor making 38, Scott Wardman and Pete Shepherdson 34 apiece and Andy Shepherdson 27. Roche then struck a superb 59 as the away side secured victory. Cayton 2nds eased to a seven-wicket win at home to Wold Newton. Adam Stubbs hit 42 ans C Morley 28no as Newton posted a meagre 115-6, then Gary Dixon's unbeaten 51, allied to 27no from Michael Pennock secured the win for Cayton despite the best efforts of Stubbs (3-28). Bridlington 2nds strolled to an eight-wicket win at home to Seamer 2nds. Phil Metcalfe hit 30 as Seamer slumped to 97 all out, Carl Parkin taking 3-30. Then Greg Miller's unbeaten 44, along with Elliott Traves' 30 wrapped up the win for Brid. Jake Sarup's 6-10 wrapped up a swift Division Three win for Heslerton 2nds at Nawton Grange 2nds. Grange were all out for 52, and despite Nathan Marwood's 3-25 Heslerton earned a four-wicket triumph. Joe Bayes' unbeaten 60 helped Ravenscar to a 10-wicket win at Forge Valley 2nds. Adam Graham took 3-2 in one over to mop up the Valley tail, after openers Steven Boyes (26) and Sean Pinder (36) had given the hosts hope, 13-year-old Hayden Williamson taking 2-10 in a fine spell. Bayes and Warwick (28 retired) then made swift work of knocking the runs off. Flixton 3rds won by five wickets at Flamborough. Chris Colley and Ben Duell took four wickets apiece as Boro were skittled for 65, then veteran John Sowden's unbeaten 31 saw Flixton home in the face of fine bowling from Ben Traves (3-11). *Pickering III 142-7 (George Baldwin 57no, Luke Shepherd 25, George Hardie 2-25) beat Ebberston II 141-6 (Jacob Waters 51no, John Metcalfe 23, Tony Evans 5-13) by 3 wkts. *Cloughton II v Snainton. Match rescheduled due to ground preparation issues. *Muston v Mulgrave II. Match rescheduled due to ground preparation issues.